In addition to being an enormously successful poker player, Mark has a proven track record as coach. As a direct result from his advise, Marks students have increased their winnings by tens of thousands of dollars. The techniques offered in this video series have proven time and time again to improve players profits. 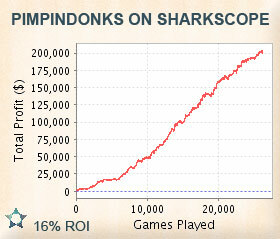 If youre serious about poker and strive to crush SNGs, then youll definitely want to buy this guide and subscribe to access all videos on SharkScopers. Select a video to view it in the player. The full version of the Videos are free for Gold subscribers. Mark Schmid has been playing poker professionally for more then 5 years. He has a simple calculated style and an approach to the game that leads to steady long-term wins, exceeding 6 figures annually. In fact, Mark has only had 1 losing month since he bagan playing poker professionally. Mark has successfully coached several players to understand and use his simple, yet often overlooked, poker techniques. Mark created this guide as a replacement for private coaching so he can reach a larger amount of students with the same advice that has made his previous students richer, at a fraction of his hourly cost.